There are certain things that I want to do before I die. We can say if I get these particular things done within my lifetime, by the time my 'time' is up, I can go with a big ol' smile on my face! -Be an extra in a movie. Oh, and one of the biggies: Meet Betty 'My Goddess' White! So, that being said, what is the next best thing to actually meeting Betty White? 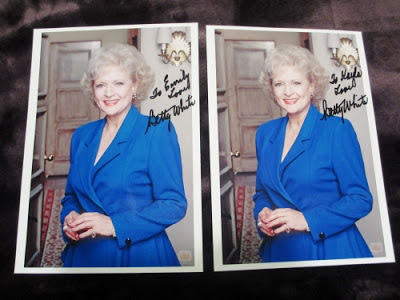 You read those 3 words absolutely correctly; I am now in the possession of a legitimate Betty White autographed picture thanks to my wonderful friend Emily, an equally as big fan of hers as I am. 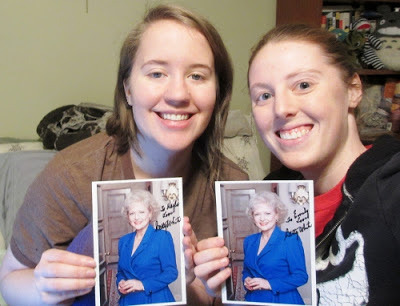 For my birthday this past November, Emily actually went online and found an address to send a self addressed envelope with pictures you want autographed to Betty White. 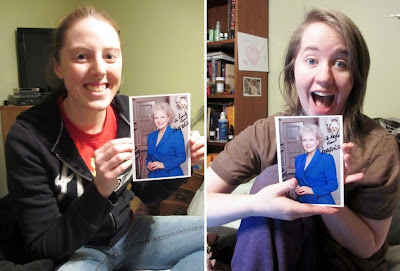 She was told it might take awhile, but Betty responds personally, autographing each picture and sending them back to the people who requested them. Emily sent two pictures back in March of 2012 hoping they'd come back before my birthday, but alas, November 17th came and went and still no pictures. Fast forward two months and she got a little package with a return address of Mrs. Betty White! Yes, I'm quite happy. How could you tell?! Now all I need is to get a beautiful frame for this beautiful and important picture! Maybe even a few spotlights to shine on it. That was super nice of your friend to get an autograph for you. These days, you'd be hard pressed to find celebrities that actually do autographs that are requested to their address. So it's super cool that Betty White did it. She's definitely an icon. As that's sweet! And I've had a secret Wish to do roller derby someday too. I'm getting old though so I'd better get on it. You go girl, that's SWEET!! Seriously girl, that' is awesome!! You have a very thoughtful, wonderful friend and I'm so glad another of your dreams came through!